The data-gathering sensors embedded in the Technical Pitch are activated as soon as the ball is thrown. TOKYO -- As teams across Asia and North America gear up for the 2018 baseball season, a special ball developed by a small Japanese software company is gaining attention. This year, Little Leaguers will be able to train using the same cutting-edge technology as the pros. The i-Ball Technical Pitch, developed by Japanese software company Acrodea, has three sensors in its core that gather data on pitch speed, type and spin rate, as well as the trajectory of the throwing arm and the flight duration. The sensors then connect to a smartphone via Bluetooth to display the data collected through a dedicated app. The embedded battery is activated automatically as the ball is thrown and lasts for about 10,000 pitches. Monitoring a pitcher's performance is not a new concept. Danish company Trackman, for example, has developed products that are widely used by professional teams. The systems, however, are based on the 3D Doppler radar technology used for interceptor missiles, and require installation at a stadium or training facility. 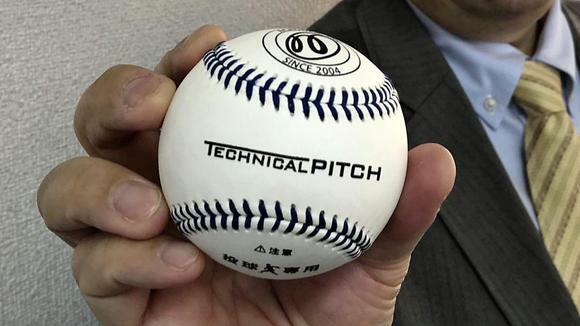 Initially priced at 21,060 yen ($197) apiece, the Technical Pitch may not be cheap for a baseball, but does not compare with the tens of thousands of dollars it would cost for a professional-range product. The figure is also around the most parents are willing to pay for a present for a child of elementary school age, according to Acrodea President Junya Tsutsumi. The first batch sold out in about a month after its launch late last year, much faster than expected, as parts supplier Alps Electric struggled to keep up with demand. Eight professional teams in Japan tested the product during their autumn camps in 2017, and a number of players have decided to continue using it. Some teams have also incorporated its use into their scouting activities. Moreover, the Technical Pitch has been a hit at the amateur level, from Little League through high school and adult teams. According to Tsutsumi, many pitchers at amateur clubs say the product has added a video game-like element of entertainment to training, which until now has relied on gut instinct and the experience of coaches. The next stage of development for the Technical Pitch, however, could be even more exciting for amateurs and professionals alike. Pitching data gathered by the ball will be uploaded to the cloud via the app. Big data analysis can then identify common age-specific issues for pitchers and propose training solutions. The company plans to charge monthly fees to access the information and hopes to generate 1.5 billion yen in sales in five years from the service. The ball is set to go on sale in the U.S. and the company is considering the development of similar balls for sports such as cricket, potentially opening up huge markets on the Asian subcontinent. Acrodea made its initial public offering in 2006, at a time when it enjoyed a monopoly on built-in cellphone software. The advent of smartphones, however, made profits plunge and forced a strategic shift to app development. But the company struggled for years; it has had a "going concern" status on its annual earnings reports since 2010. The turning point came about three years ago. The emergence of the internet of things suddenly provided an opportunity to exploit the sensor technology it had developed for cell phones.